If you are holding a beach themed wedding, keeping the theme universal makes the planning and preparations much easier. When you begin planning the bridesmaid luncheon, why not consider combining the male and female attendants “thank you” party into one competitive and fun event. Planning the wedding attendant luncheon for your entire bridal party can be a great deal of fun and take very little effort as long as you identify your main goal of the event and create an entire afternoon around that activity. Since you are hosting a luncheon, a beach barbecue would be a thematic and fun. An afternoon activity that would provide lighthearted fun and competitiveness between the two sides of the bridal party could include a “sand castle building” competition at your local beach. This unique and exciting activity would provide a great opportunity for everyone to meet and get to know one another and express their creative side along the way. Additional activities that could be included in the day’s itinerary could include a game of beach volleyball and a bonfire. However, if you intend to build a fire on a public beach it is often a good idea to check with your city council to discover if any special permits are necessary prior to hosting your event. Taking time to locate beach themed wedding attendant gifts for each member of your wedding party is actually easier than you might think; many online and retail wedding planning outlets have unique and creative wedding party favors to give to your friends and family on this special day. 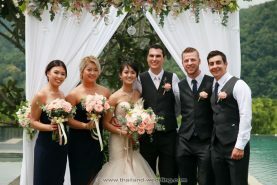 Short Description: If you are holding a beach themed wedding, keeping the theme universal makes the planning and preparations much easier. When you begin planning the bridesmaid luncheon, why not consider combining the male and female attendants “thank you” party into one competitive and fun event.